Pull the parking brake lever fully up to immobilise your vehicle. 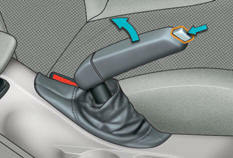 Pull the parking brake lever gently, press the release button then lower the lever fully. When the vehicle is being driven, if this warning lamp and the STOP warning lamp come on, accompanied by an audible signal and a message on the multifunction screen, this indicates that the parking brake is still on or has not been properly released. When parking on a slope, direct your wheels against the pavement, apply the parking brake and engage a gear.